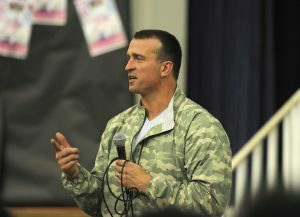 Former NBA player Chris Herren traveled to Pottsville, Pennsylvania to talk to fans and their families about his difficult recovery from a heroin addiction in Martz Hall in early September. Since September is National Recovery Month, it was a very appropriate message that Herren was trying to convey to his listeners, some of who might be going through something difficult like what this basketball star did. Herren’s main message was that the lives of addicts matter too, and that people in their lives should not give up on them because those are the folks who need the most support. He commented that he believes that spreading his own story can hopefully impact and change the direction of someone else who might be in a similar path. The Fall River, Massachusetts native was a basketball star during his college years at Boston College, but he failed a couple drug tests and transferred to Fresno State. His fresh start was going well for the most part until the Gatorade Player of the Year failed yet another drug test and was sent to rehabilitation for four weeks before he could return to the team. After graduating he was selected as the 33rd overall pick by the Denver Nuggets in the 1999 NBA Draft. He spent the next two years with the Denver and Boston teams before going overseas to pursue a basketball career in a number of countries like China, Turkey, Italy, Poland, and Iran. In 2004, Herren got the wake-up call of his lifetime as he nearly killed himself in a car accident after using some crystal meth and then driving into a utility pole. The paramedics actually pronounced him dead for 30 seconds, but he came back to life and got a whole new perspective on his behavior. This experience with drugs and how it almost ruined his life has made him a changed man, and he travels around the country to share his story. Herren recently spoke at Martz Hall in Pottsville, Pennsylvania to discuss addiction recovery and how it should best be handled, for those experiencing it and their friends and family members. It was a great turnout, and there’s no doubt that some lives were changed for the better thanks to the athlete being willing to share his story.